​​The Barkway Pavilion - completed in 2015, the new Barkway Pavilion and Community Room replaced the previous old and dilapidated sports pavilion situated on the Barkway Recreation Ground. Built with major grants from NHDC and the Football Foundation together with monies from fund raising events and many welcome donations, this building provides a valuable amenity for the village. Under a special agreement the football facilities are used mostly by Royston Town FC youth teams with the aim of encouraging the young people of Barkway to participate in organised football activities. The added benefit of a sizable community room with kitchen and toilet facilities provides a place for Barkway Groups to meet and the room is also available to hire for such events as birthday parties, weddings, etc. The Church - there has been a church on the Barkway site since Norman and possibly Saxon times. The church chancel was rebuilt in the 13th century and the nave widened, aisles and clerestory added in the 15th Century, along with a tower. In 1861, the main part of the church was restored by Mr Vernon Harcourt of Newsells Park, whilst Colonel Clinton, who lived at Cokenach worked on the Chancel. During this restoration however the tower collapsed and a new, larger tower was built in its place. The tower itself contains a peal of 8 bells, six of them recast in 1787 by Briant of Hertford and a further 2 added in 1794, with the inscription, "Give Peace in our Time O Lord". There is one Priest's bell, inscribed "James Bartlett made me in 1688 TE" The turret bell on which the clock strikes is pre-restoration and is the only one in Hertfordshire from the Bury St Edmunds Foundry. The church is well maintained by the generous work of The Friends of Barkway Church who have raised a great deal of funds over the years to fund the considerable costs involved. ​The Chapel Barkway - Congregational Church, known as Barkway Chapel, is affiliated to the EFCC (Evangelical Fellowship of Congregational Churches). The present Chapel was built in 1884. 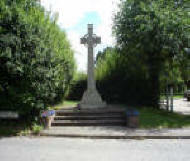 Prior to that, the Chapel was situated where the cemetery is in Royston Road. Two photographs of the original building can be seen in the present Chapel. These days the congregation is not large enough to support a Minister. The services are led by visiting speakers, both Clergy and Lay Speakers. These are from various Christian denominations and include C of E, Baptist, Methodists as well as Congregationalists. 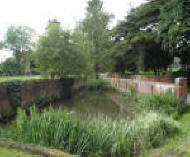 ​The Wagon Wash - Just off the High Street and down Church Lane, there is what appears to be at first glance a moat. But this is another part of Barkway's history as a major coaching town. Coaches would drive through this expanse of water in order to clean their wheels and name plates before resuming their onward journeys. ​The Tally Ho - the last remaining pub in the village. In days gone by Barkway boasted its own brewery, several shops and pubs. But, although population numbers have remained fairly constant, the Tally Ho is the last remaining pub. And it is a reminder that the Puckeridge Hunt, amongst others, was prominent in the area. Renowned for its friendly atmosphere, fine food and extensive wine list, the Tally Ho is also proud of its range of malt whiskies. Regular quiz nights take place and popular themed evenings are organised from time to time. ​RAF Barkway Mast - you either love it or hate it. It's either an eyesore or a beacon standing out over the village ,visible from miles away, but always showing you the way home. The steel mast replaced an earlier wooden one which formed part of the RAF's wartime and post wartime GEE navigation system. This system was developed by the USA Air Force into the LORAN system, which was used to improve aircraft navigation, until GPS made it obsolete. In the cold war years the mast also formed part of the NATO/USAF/RAF early warning network. Today it maintains a silent vigil over our beautiful village - a reminder of the vital geographic and strategic location that Barkway once was. The Reading Room - this building was gifted to the village in 1897 and has had many uses over the years. A grade Ii listed building, it has been used in recent times as the meeting place for Barkway Parish Council. A book lending service was set up in 2009 but the building had to be closed for important and necessary remedial work. Now completed, the Reading Room Management Committee re-opened the building on 29th January 2011 as a meeting place, book lending centre and for it generally to become a centre of village activity. Barkway Village Hall was built as a Women’s Institute and opened in 1926. In 1965 the Hall was given to the village, to be run as a charitable trust (registered charity number 272922). a handbook on the Management of Barkway Village Hall won the Parish Challenge award. The early 1990s also saw improved access, facilities for the disabled added, a new bar area near the main entrance and improved kitchen facilities next to the stage. Those facilities have been improved still further recently, and during 2004, the heating and hot water system was completely replaced thanks, in large part, to a highly successful village bond scheme and numerous other very well supported fund-raising events as part of our Heat Appeal. In 2006 the Hall celebrated its 80th anniversary with a variety and music hall evening featuring a re-enactment of the opening ceremony.